Whether working on the New Holland 545, LV80 or the new U80, New Holland Skip Loaders deliver uncompromising power and performance in every industry. When working on a New Holland Skip Loader or any New Holland machine its important to have good tires under you. Not only do tires help you get better performance but also keep the operator safer when working on hills. Because of this Monster Tires has set to offer the lowest prices on New Holland Skip Loader Tires, here at Monster Tires we want every operator to work as safely as possible, contact us today to find out more about our New Holland Skip Loader Tires. New Holland Skip Loader Tires – Affordable and Dependable! The safety of your work site depends on the quality of your New Holland Skip Loader Tires. So does the job you are trying to get done. If you are looking for a replacement Tire Package for New Holland Skip Loader Tires, you have come to the right place at Monster Tires. We stock LV80 | V80 Skip Loader Tires for your New Holland Skip Loader. 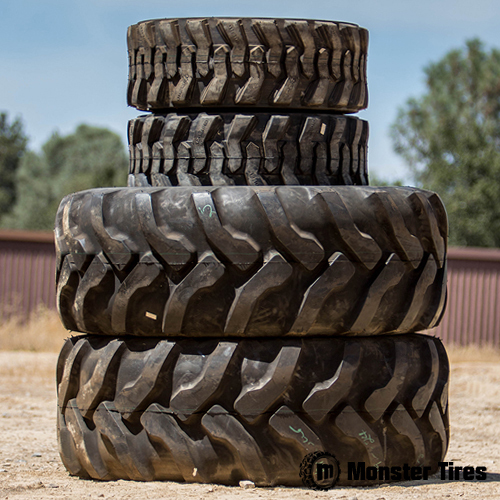 Our tires are durable and reliable, so they will keep your crew safe and your jobs moving forward for years to come. High Quality Affordable Construction Tires. Many people shop for the cheapest New Holland Skip Loader tires they can find, when their old ones start to wear out. This is a mistake. You should look for high quality, because this is what keeps you from having to replace your New Holland Skip Loader tires frequently. In fact, with high quality Construction Tread Tires for New Holland Skip Loader or Off the Road Tires for New Holland Skip Loader from Monster Tires, you can count on your tires more than paying for themselves in the amount of extra time you get. And that makes them more affordable. Trust in Monster Tires for your next set of New Holland Skip Loader tires!